This unique resource identifies and analyzes fourteen major legal issues in government contract law and highlights three important legislative changes that have occurred over the past 50 years and altered the practice of law. Authored by C. Stanley Dees, who was directly involved in many of the landmark cases examined here, this one-of-a-kind resource delivers a level of insight and historical perspective no other reference can match. 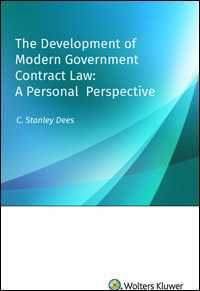 Only The Development of Modern Government Contract Law: A Personal Perspective describes the evolution of government contract law and practice, thoroughly examining each of the subject areas and delivering unmatched insight and analysis. No book today provides the personal perspective of a practitioner who tried or argued key cases in many of these important areas. As government contract law becomes increasingly complex, every legal professional must understand the elemental issues that structure the law. The past half century has formed the foundation period of modern government contract law, and C. Stanley Dees has been directly involved every step of the way. Quite simply, it would be difficult to develop true expertise in this practice area without taking advantage of the insights and analysis provided in this unique work on government contract law. Fixed-Price Procurements for Development of Major Systems: Lockheed, Litton, General Dynamics, et al. The Development of Modern Government Contract Law: A Personal Perspective is a foundational, must-have resource for every legal professional practicing in the government contracts arena, delivering invaluable insights and perspective that will directly inform the reader how to manage specific legal issues. CHAPTER 15. The Federal Circuit: Changing Direction?